Sedona’s cinematic red rocks had been flashing across our windshield for almost an hour. It was hard for the driver to keep her hands on the steering wheel due to the beauty at each turn in the road. My iPhone camera was going off every few minutes, regardless if it was a good shot or not here at Cathedral Rock Sedona. 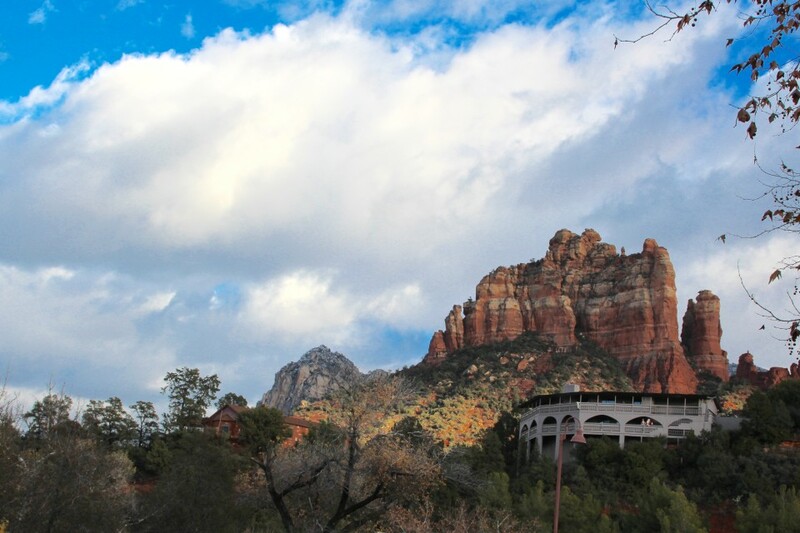 There is no denying that Sedona’s landscape is larger than life. And the beauty of one of Arizona’s most photographed sites, Cathedral Rock, was staring back at us. The famous red rock buttes and the deep crimson mesas look striking against the saturated deep blue sky. 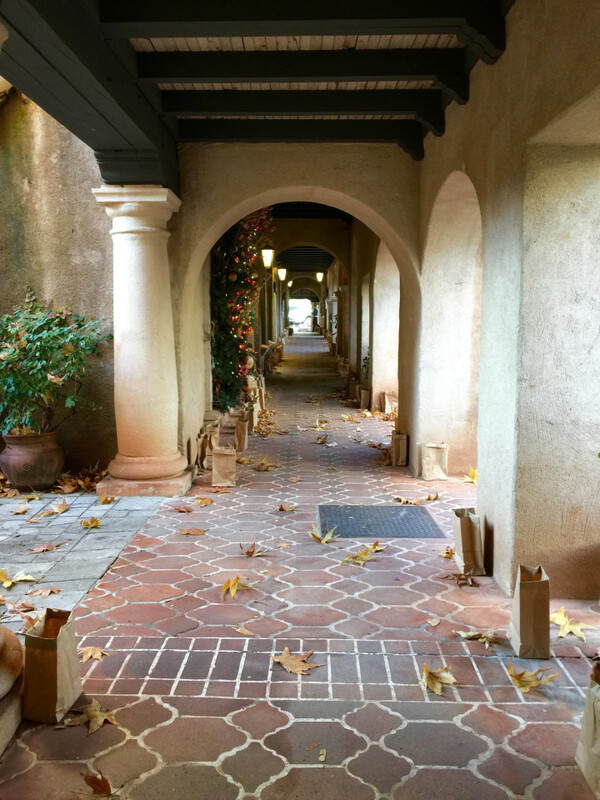 On a cool afternoon in late December, we had driven from Santa Fe’s Plaza in New Mexico to the main street of Sedona, Arizona through America’s Great Southwest. Road tripping across this mountainous and desert landscape had us on the edge of our seats admiring her natural beauty along the way. 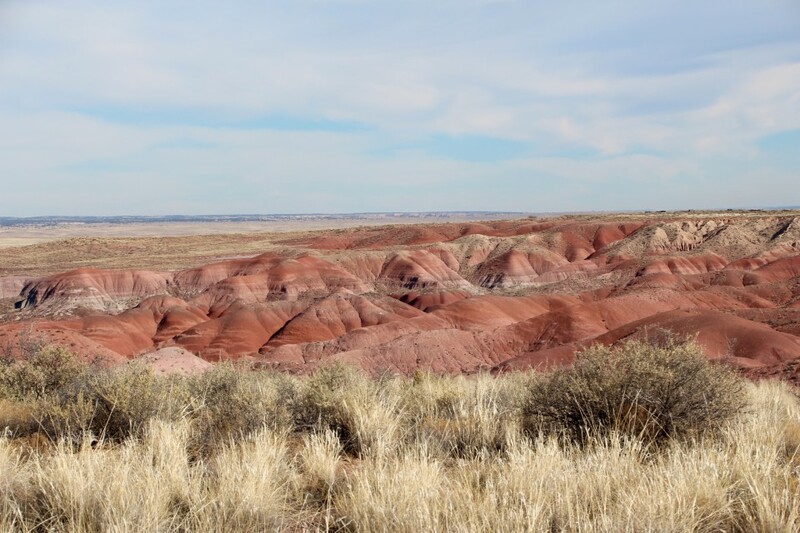 We even managed to make a stop at the Painted Desert and the Petrified Forrest National Park. I had always wanted to stop there on my treks across 1-40, but just never had the time or never took it. 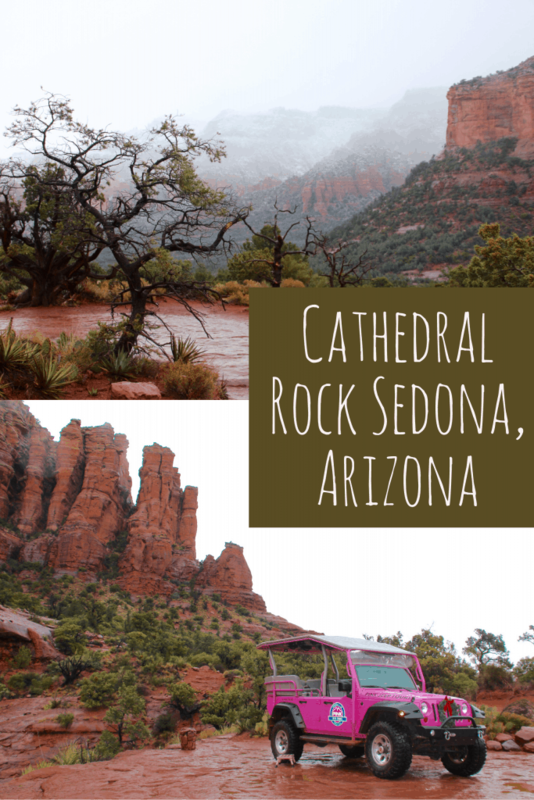 Upon arrival in the Uptown area of Sedona, we could do little more than gawk and ogle at the beautiful Cathedral Rocks that surrounded us. I scanned the horizon and located the well-known “Snoopy” rock right away, lying on his back on top of his doghouse among the other jagged rocks. 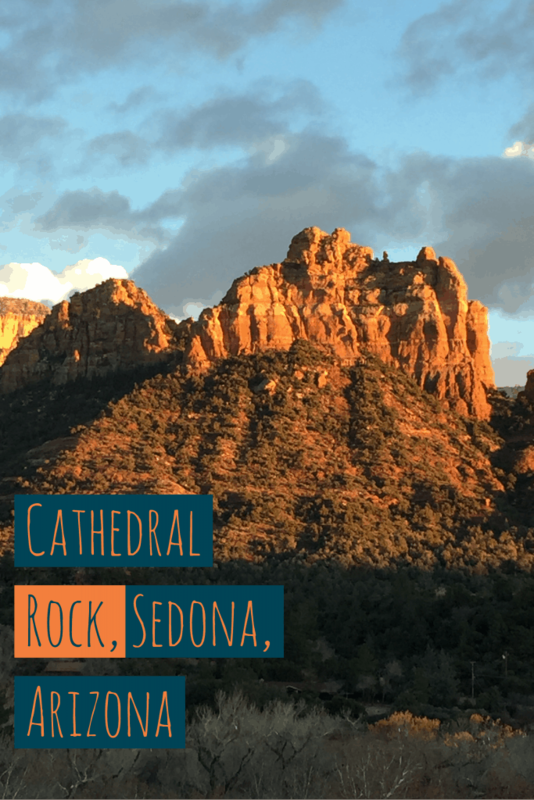 Many rock formations in Sedona are named for how they resemble things… thus Cathedral Rock looks like a cathedral, in all its glory. It takes a bit of imagination to see the shapes, but after a while, you just stare and say “wow”! Our forecast was looking for snow and I was hoping that was going to happen. 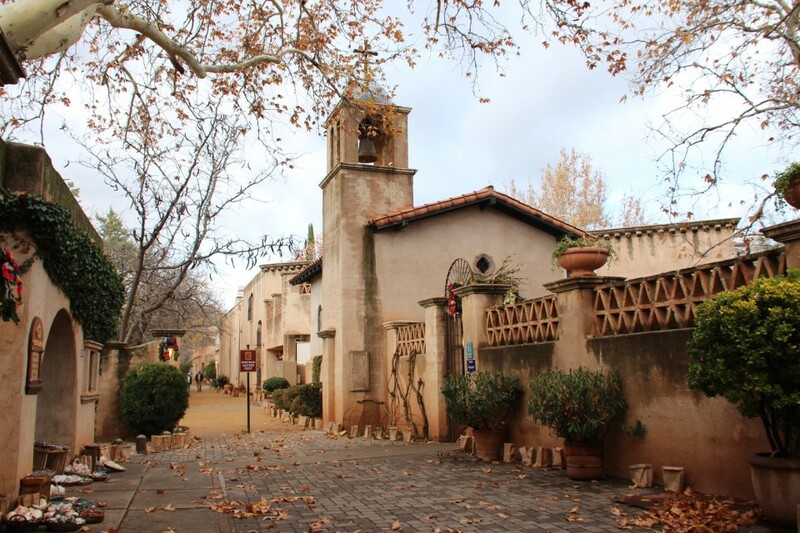 For such a small uptown area, Sedona appeared to be a busy city center of four-wheeled drive pickup trucks and high-end foreign cars. But with few people in site, we chose a parking spot for our 2016 Hyundai Hybrid and decide to walk around town a bit before heading to our hotel. 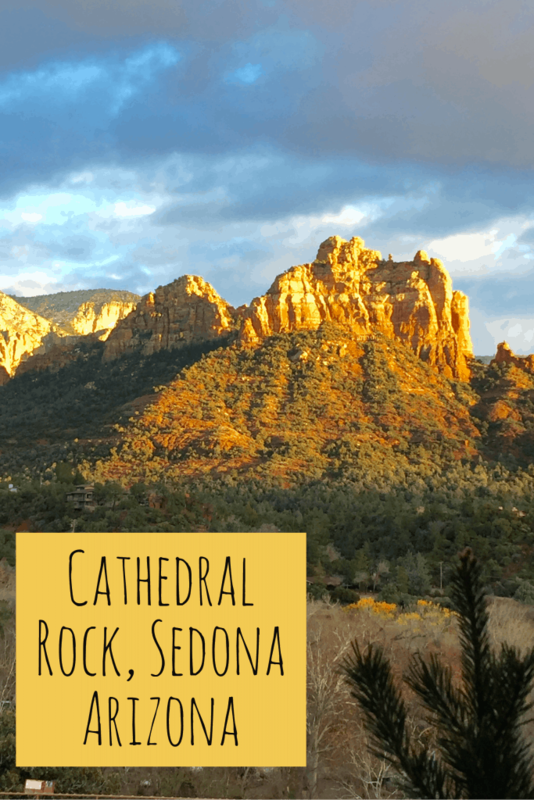 We were staying a good 15-minute drive away at the Hilton Sedona Resort and we didn’t want to backtrack over there just yet. We had a Sedona Trolley Car tour reserved and had less than an hour to spare. The uptown city is certainly walkable, but while we were there, it started to get colder by the minute, so we tucked into one of the cafes on the main drag and waited it out until our tour began at 3. Our views of Cathedral Rock were incredible though. 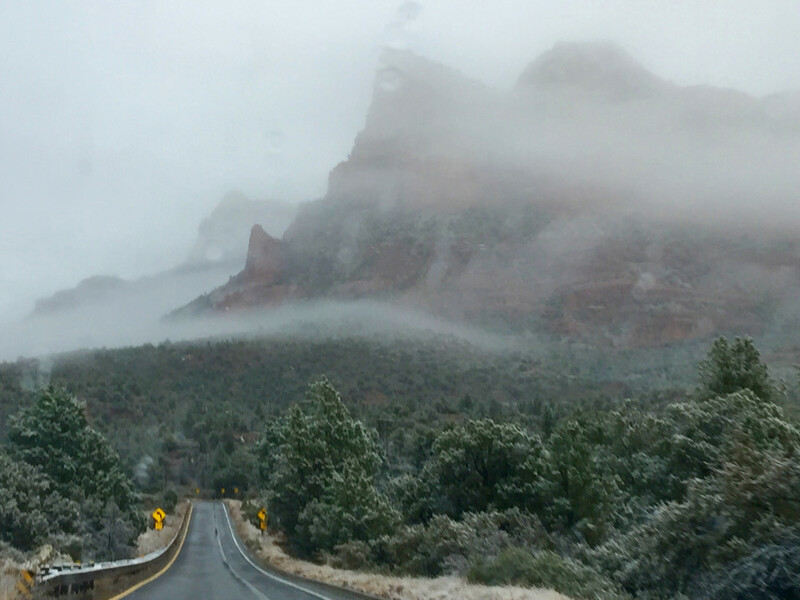 If you decide to take a drive along Oak Creek Canyon on Highway 89A between Sedona and Flagstaff, you will be mesmerized by the sheer beauty that follows along Oak Creek and the views of Cathedral Rock. 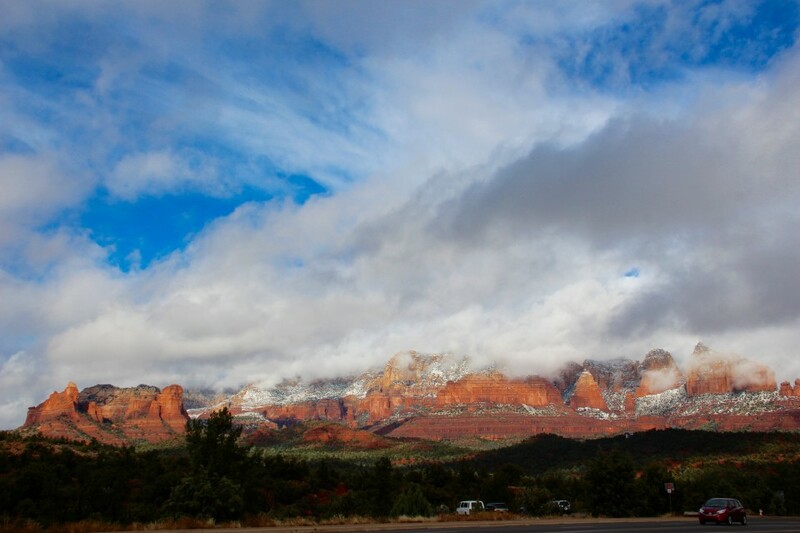 Here you will see some of Sedona’s more popular stops, like Slide Rock National Park and the Oak Creek Canyon Trail. This is a remarkable 16-mile drive, even if you drive it for only a few miles and then turn around, it is breathtaking. 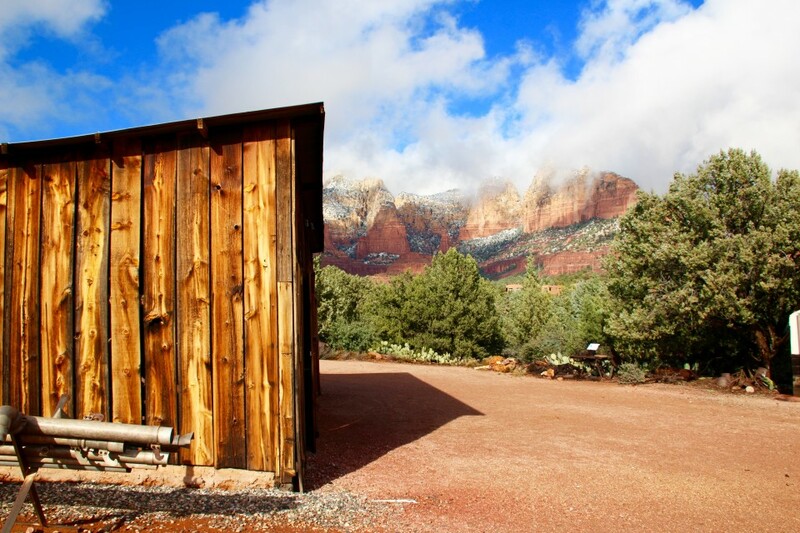 It is no wonder that the settlers of Sedona decided to set up camp here years ago. 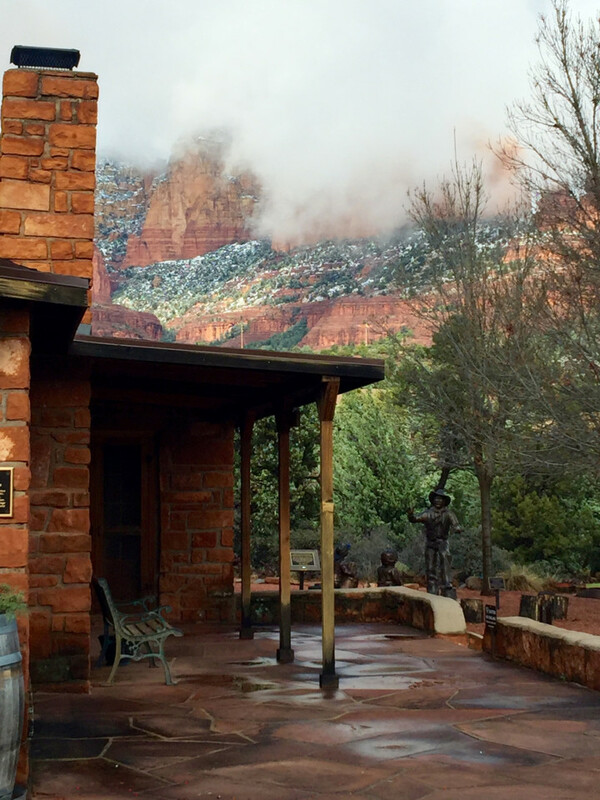 Sedona has something different for everyone and is something different to everyone. 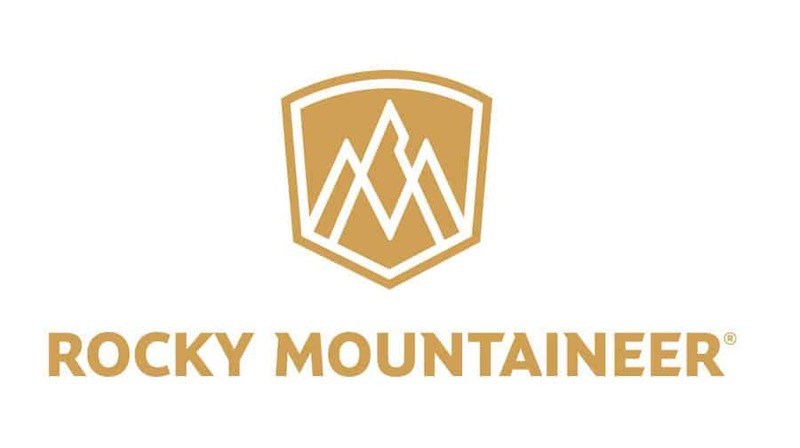 Ask the new agers, the cowboys, the artists, the tour guides, the shoppers, the tourists or even the mountain men. 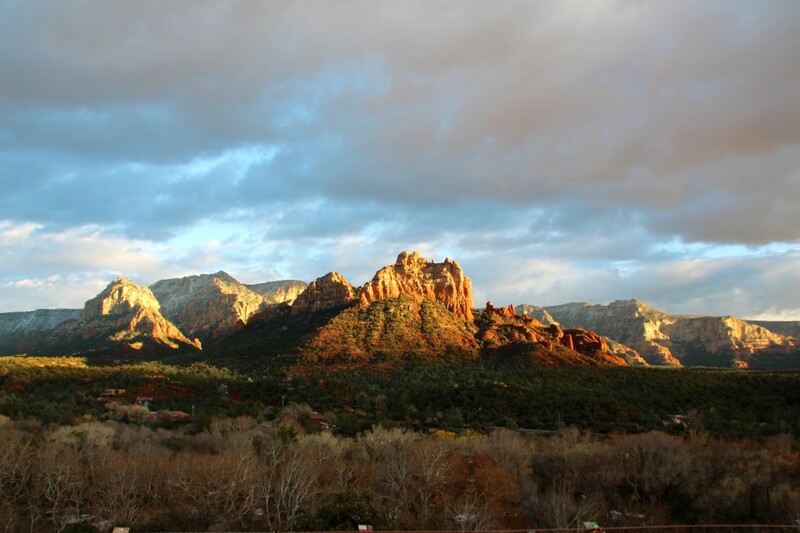 Each of them will give you a different answer as to what Sedona is all about. 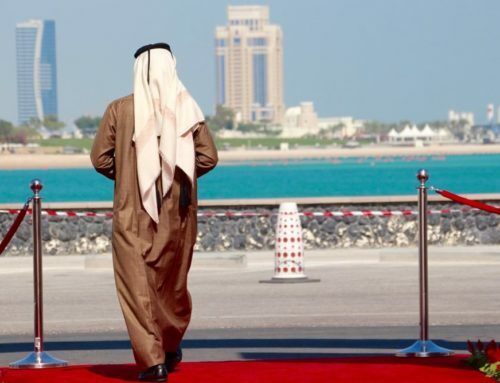 I have lived less than 3 hours away from here for over 25 years and think of it in a completely different way than many. Is it a shopper’s paradise? A metaphysical vortex, an endless supply of cheap, dirt-red t-shirts, an art lover’s pie in the sky, a hiker’s haven, an off roader’s dream, an ancient Indian sacred place? It is all of those things plus more! It is many different things to many different people, yet somehow it pulls off the title of being one of the most beautiful places in the United States! 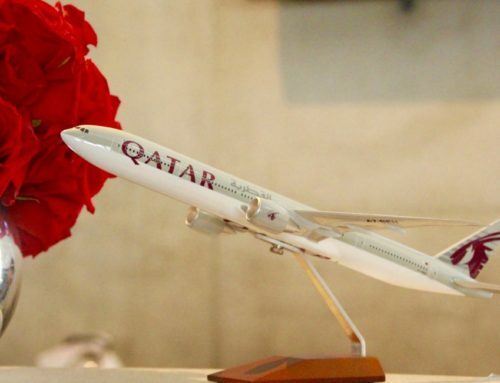 It definitely is a quirky city and has many things to offer. Plus did I mention those views of Cathedral Rock? I had been to Sedona countless times before, but somehow I had never stopped here. 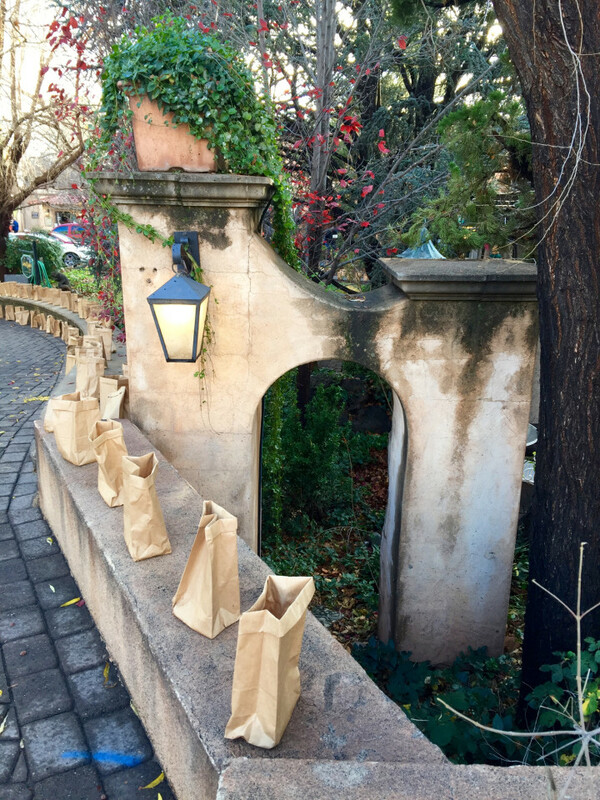 Tlaquepaque is an artisan shopping village that was built in the 1970’s by a Nevada businessman named Abe Miller. He had been in Sedona for vacation. He picked the perfect spot of land to build his dreamy little Mexican village. The views literally seem to go on forever in all directions and of course, Cathedral Rock is one of them. I had even heard there was a vortex there. 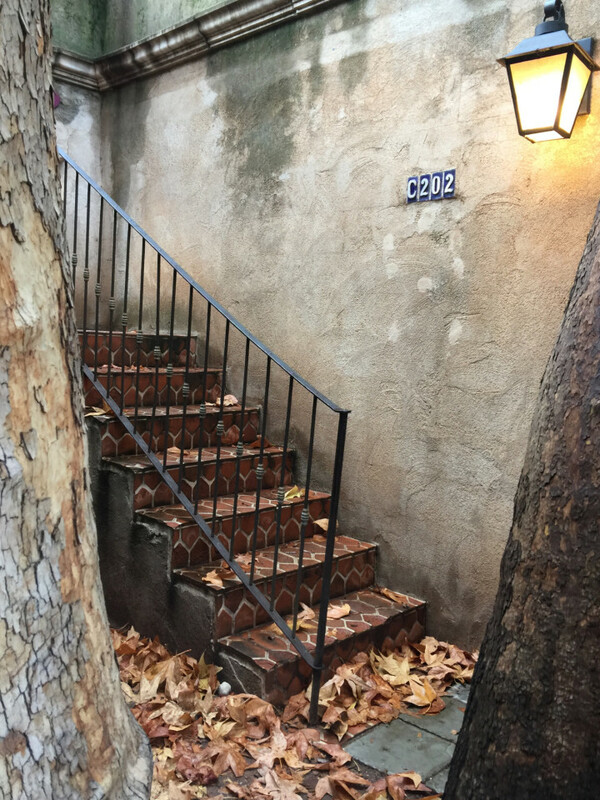 I had often wanted to explore Tlaquepaque, so I was glad that finally, my travel companion insisted that we stop. 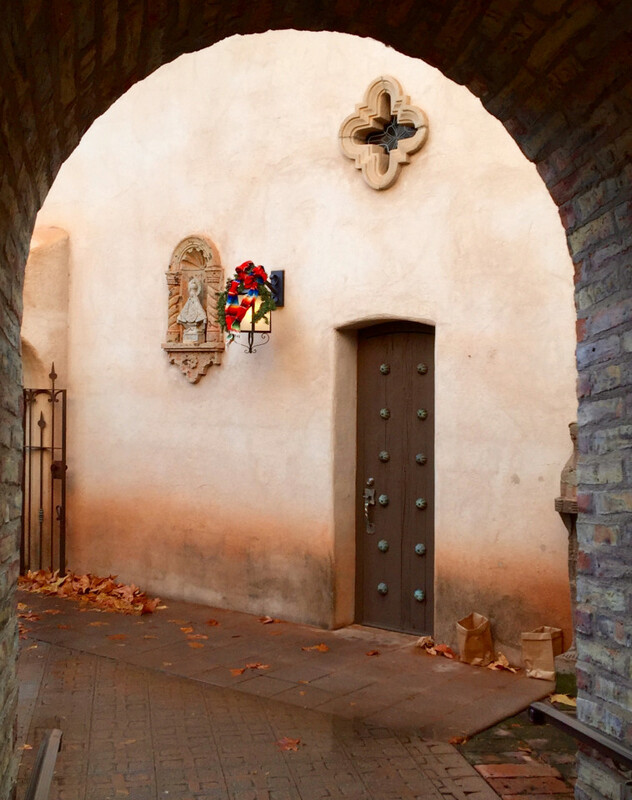 Immediately upon our entrance into the village, I could feel the vibe: it had a hacienda Old Mexico meets upscale Arizona vibe. We were not in Mexico, but for a moment I might have thought that I was, at least a high-end Mexico! Tlaquepaque is now an arts and crafts shopping village with fountains, arches, and endless sycamore trees. It has everything from a chapel to as many as five courtyards. 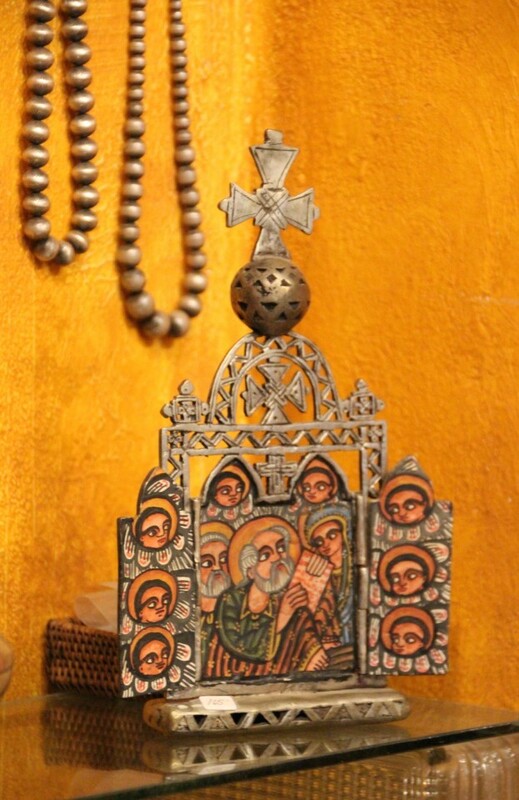 The artist of the main painting in the chapel had recently visited and she told of how much Mr. Miller loved this little village and how special it was to him. 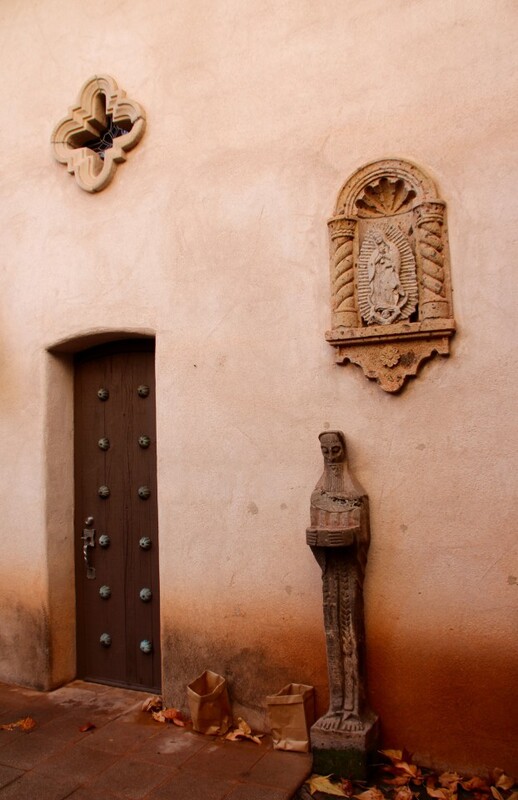 Everywhere you look, every nook and every cranny it is filled with old wooden doors, Mexican architecture details and the perfect shade of deep orange to cougar tan hide. This place is the pride of Sedona. 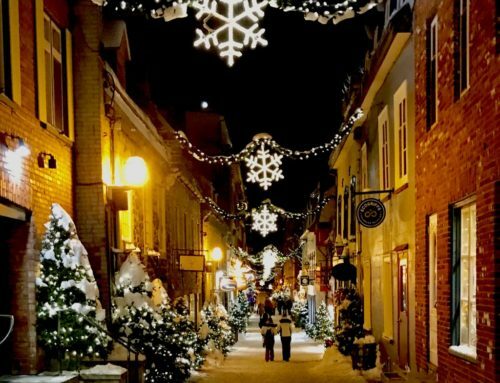 I do have to add that the charms of the village can wear on you, as you have to navigate around countless numbers of people who have also come to see this little town within itself. There were times it was hard for me to even get a clear photo shot, so off-season and mid-week visits would be best when you come to visit. 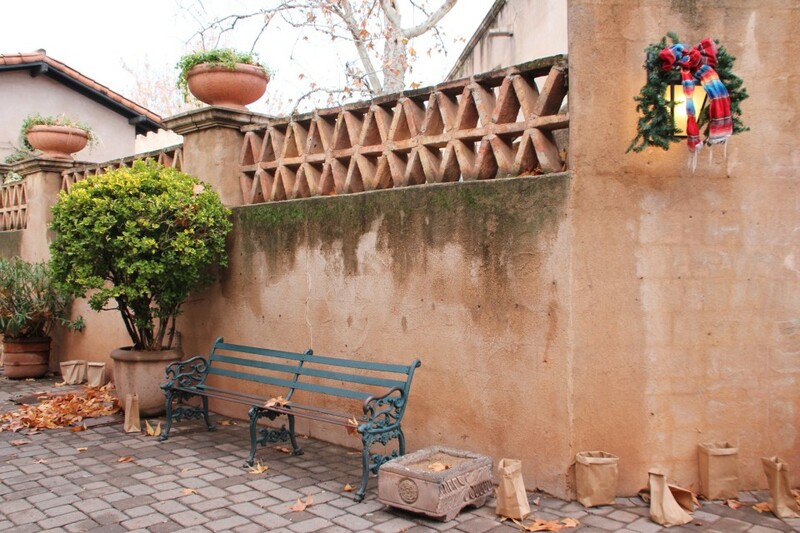 Tlaquepaque was built to replicate a traditional Mexican village. 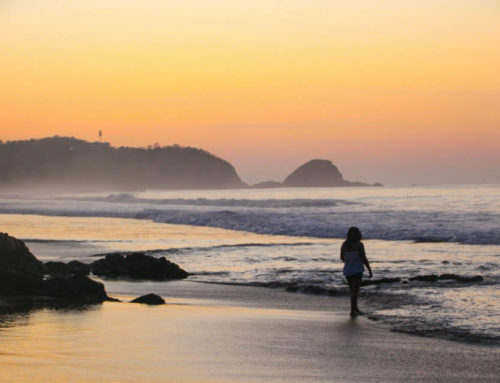 Abe Miller, along with his perfectly chosen crew (an architect and general contractor), flew his private plane for countless hours over villages throughout Mexico to get “the look” and “the feel” of the village just right. 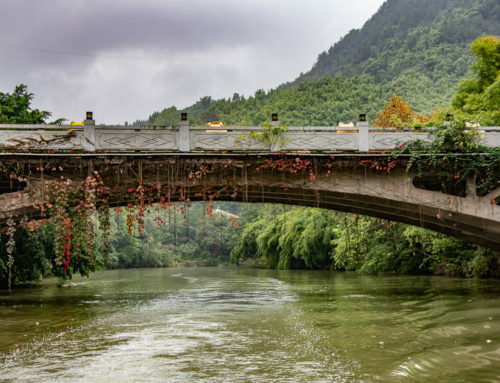 They studied the way villages were built, how they functioned, and what materials were used. They then went about building this little town to replicate all the towns they had investigated into one. It is not a replica of any one town, but a medley to represent many villages in Mexico. Today it serves as a shopper’s haven and an artisan center along with occasional live shows with music and dance. As the sun sinks below the scarlet colored rocks, where the fading sunlight strikes the rock to make for a spectacular viewing, I took one last peek at this stunning place from the Shops at Hyatt Pinon Point, while enjoying drinks out on the terrace at Sound Bites Grill. This is one spectacular view of Cathedral Rock! (and the live music, dinner, and drinks are amazing as well). The Hilton Sedona Resort is located in Oak Creek Village with spacious suites, mine had a separate living room, a kitchenette, a fireplace and two queen beds in a separate room. They also have an 18-hole championship golf course and swimming pools, but it was too cold for me to visit this time around. 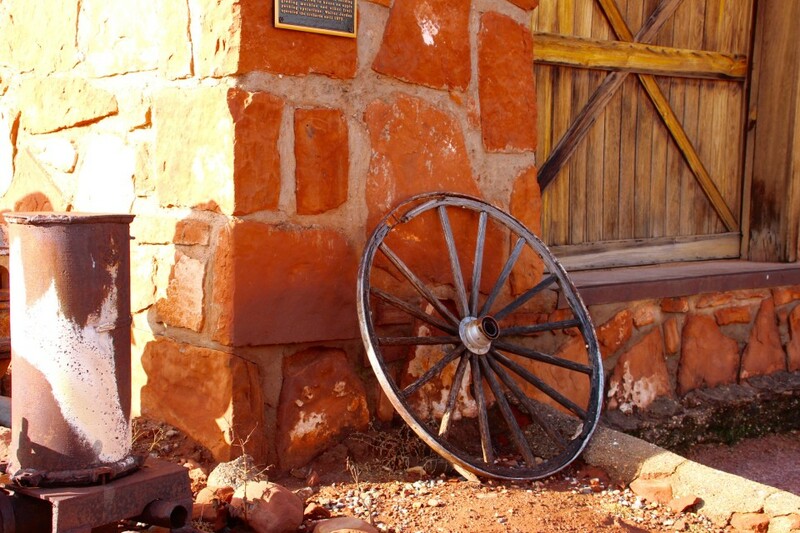 Sedona Trolley Car: Take a quick ride around to see some of the areas from local guides. It is cheap, leaves from uptown and easy to do. 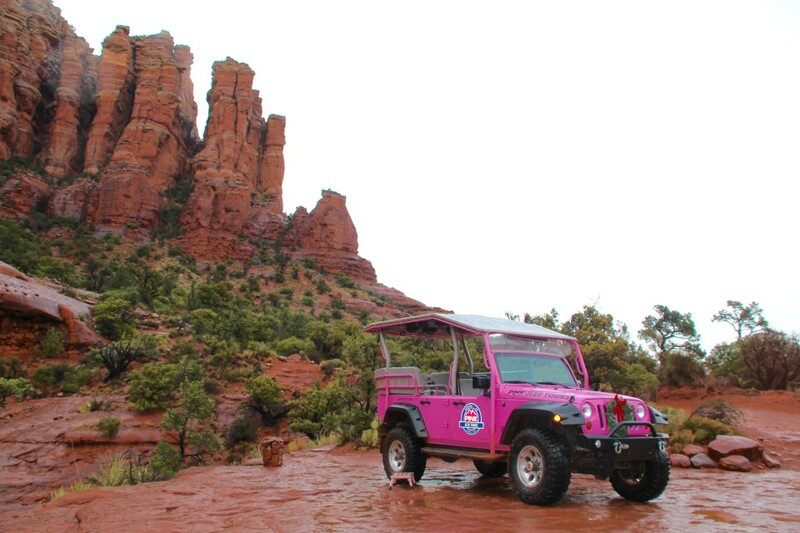 Pink Jeep Tours Sedona: This is an absolute must and quite frankly the best thing I did while in Sedona. The guides are not only knowledgeable but smart, interesting and fun! What a combination. My driver was Doug, a native from Sedona. He had all the qualities of a fantastic guide, including the fact that he was an Eagle from the Boy Scout Association! He knew the Broken Arrow Trail like the back of his hand and handled the vehicle in steep inclines and snowy weather with no problems! Disclosure: My Trip to Sedona was sponsored by the Sedona Chamber of Commerce and Tourism Board and my vehicle was provided by Drive shop. Pink Jeep was also a sponsor on this trip. 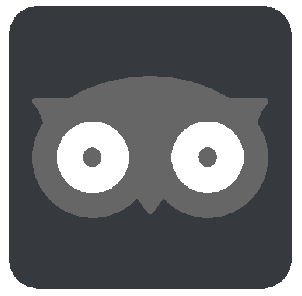 Affiliate links are in this post. Ann, thanks for reaching out! I will send you an email separately… you are going to love it and he will too! We missed this when we were in Arizona on our Epic US Road Trip! Dang, well you guys just need to come back.